Promotion is one of the basic need to grow your business and establish a new image into the real world. 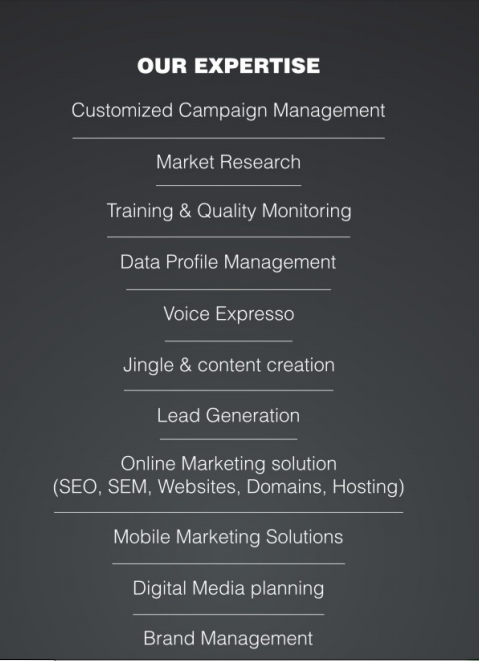 So we provide better and new ways for promotions through campaignings like sms , voice calls, mobile app messaging , hybridnumber , hybrid website, digital marketing , bulk emailing..
Lead generation is the generation of consumer interest or inquiry into products or services of a business. we can genarate leads for different sectors from different processes.. Hybrid number is a virtual number can be your mobile number, tollfree number. From this service you can never miss your business call even your number is not reachable, busy or switched off calls will diverted to your executives. Additionally Hybrid number have all the features like recording, call distribution, parallel ringing, conferencing, greetings, etc. . .
We assess the changes in the business environment to determine the current and future needs and acquire and analyse information in order to understand the market and give the inputs to our clients.Market research is a key factor to maintain competitiveness over competitors. Market research provides important information to identify and analyze the market need, market size and competition..
when one email is sent to multiple users. The emails sent on large number of email is bulk emailing . bulk emailing is generally used by companies to direct market services and goods to consumers. Bulk messaging is commonly used for marketing but also for information and communication between both staff and customers. Bulk messaging lets you deliver SMS messages to mobile handsets anywhere in the world.